The fighting mind, body and spirit is always under construction, but cannot be achieved alone. 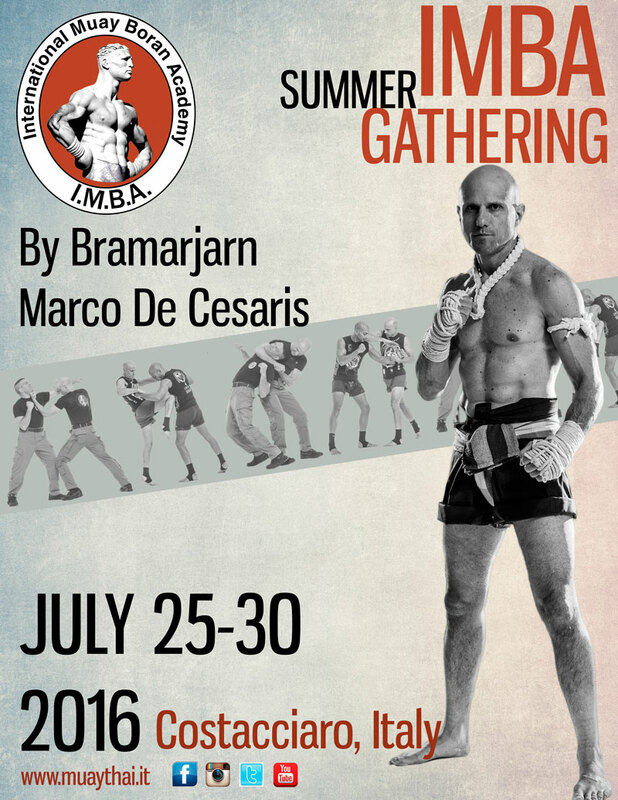 Grand Master Marco De Cesaris does not just lead an international academy for Muay Boran; rather, he lays a foundation of knowledge, opportunity and more significantly, interaction. In a small Italian camping village, called Costacciaro, IMBA instructors and students unite, co-operate and ignite the body of knowledge that is the IMBA curriculum. Gathered, not just to train, but also to experience and achieve something untouched from daily training life at home. Many meet for the first time, others have connections from years ago. The spoken language between the students is seldom their native tongue, yet the common language everyone understands, relates to and achieves meaning from, is Muay. IMBA, as an academy, keeps its perspectives on the modern pulse and its heart rooted within the art’s heritage. With such collaboration of international energy, of which this year’s camp certainly was, Combat Muay Boran, Muay Pram and Muay Lert Rit took form not as codes and principles but working entities exposed to new minds and open visions. An international gathering of such brevity stimulates not just the practitioner of the art but also the art itself. An art would be nothing if it were not for the bodies and minds breathing life into the movements and methods. Anyone having experienced Costacciaro may spend his or her whole life musing over the unique experience that these five days provide. Not least, students come to think long and hard over awakened emotions and stimulated ideas. Twice a day everybody took their place in the warm-up run in anticipation of De Cesaris’s teachings and insights into what martial practice is and can mean. Many years ago, Master Marica Vallone (Grand Master Marco De Cesaris’s second in command) not only taught me how to tie my first pair of traditional Thai shorts, but she also said something to me that I have not forgotten. On my very first trip to Costacciaro, she told me that competing with the others in the trainings did not concern her because for just once a year this camp was always about her, always about how she is doing and a way for her to gauge herself. This stuck with me because she was so full of passionate and conviction that I understood there to be another meaning to the “gathering in Costacciaro”. One needs to remove oneself from the norm in order to challenge the mind and anything experienced in the heart of Italy is going to be an experience in itself. Of course, it is not difficult to be seduced by the sweet aroma of olive trees under the blazing sun, or by powerful mountainous views enjoyed by espresso-fuelled minds. Five days in the countryside with the most diverse group of people is foundation enough for only good things to happen. Yet, since my first trip to Costacciaro it is now clearer to me what this gathering can provide. Yes, it is important to update knowledge, as everybody does at Costacciaro, However it is not just about collecting techniques. Techniques are the substance which a Muay practitioner interacts with, similar to the function and principle of a conversation being dependent upon grammar. Yet, like a language, it is just the framework, something which to transport and convey a much deeper meaning. How to access the essence at the centre of the techniques, this is the very essence to the students perpetual dilemma. To exam or not to exam? Change only tends to occur through either desperation or inspiration. Yet, when these two factors unite in the correct environment then great things can occur. I, myself did not want to do an exam, knowing what an exam would mean I be exposed to. Yet, I did an exam, we all did. Even the young son of one of the instructors cast himself out unto the gaze of many and did a wonderful job. An exam means there is nowhere to hide, not even from yourself, especially not from yourself and this is the central theme to any martial training, the enemy within; ourselves. One learns that a martial art does not necessarily eradicate fear but it will kick-start the actions you take in spite of your fear. An exam puts you under the laser beam focus of your own limitations and to this reason, many successful, high ranked, high acclaimed and successful Muay trainers present themselves with vulnerability in front of De Cesaris and all the other countries for observation, challenge and accountability. The power of the mind and body to perform when it has to under pressure lies at the heart of the martial arts. Even though an exam is not comparable to actual combat battle, some IMBA students that day may have disagreed with this sentiment. To reproduce a complex form successfully, whilst paying consideration to the nuances, invisible details and remaining composed in front of many faces, is perhaps not what most desire from a summer trip. Yet, here we all were. Many people from many lands consciously and passionately learning and being tested. What is the student looking for? For some IMBA students, the journey to Costacciaro is long and expensive. Why travel so far and for just these five days here in this random place in the Italian countryside? The close proximity and network of student to teacher, of teacher to master and master to grand master is the fundament to any great martial art network. Assistance and guidance together with the humility to achieve guidance will take any martial artist to the next level, of which will be experienced so radically unique from person to person. Accountability, training partners, teams and mentors. All of these are vital for transitioning from something mediocre to something great. If we are the average of the five people we spend the most time with then Costacciaro is stimulation enough for any human wishing to find out what more can be gained from their beloved martial art but not least what lays deep buried within themselves. This year has only served to fuel the desire for next year. As the academy grows, so too does the art. As the people wish for more, so too rises the knowledge of the masters and the Grand masters to accommodate the insatiable hunger to learn. Grand Master Marco De Cesaris has provided not only an educational platform in the form of IMBA, but Costacciaro has revealed that the human spirit wishes for something more than knowledge, it also wishes for solidarity, friendship and union.